More than 80 percent of people who wanted to participate in cash for clunkers had a trade-in vehicle that did not qualify, according to the Maritz study. DETROIT -- Last year's cash-for-clunkers program increased U.S. sales without damaging the number of future automobile purchases, as previously feared by critics, according to a study by Maritz Automotive Research Group. Maritz compared its consumer data with the federal government's data on total clunker sales, finding that about 542,000 consumers bought vehicles during July and August 2009 specifically because of the program. The study also estimated that 223,000 vehicles sold were “halo sales” -- cars purchased by consumers who wanted to participate in the incentive program but did not qualify, yet bought or leased a new vehicle anyway. 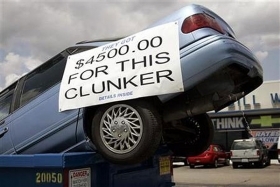 “The cash-for-clunkers program did create a large amount of incremental sales, to the tune of about 765,000 -- a pretty large chunk of total sales for those two months,” said Dave Fish, vice president of Maritz Automotive Research Group. The study suggests the clunkers program met its objective of creating jobs while replacing older, less-fuel-efficient automobiles with better-mileage, lower-emission vehicles. After a slight dip in sales in September 2009, the seasonally adjusted annual sales rate from October through December showed that automobiles continued to sell at a higher pace than before the clunkers program began, according to statistics from the Bureau of Economic Analysis, a unit of the U.S. Commerce Department. But the research also revealed that lessons remain to be learned from the inaugural program. Future incentive programs will require more emphasis on outreach and education directed at dealers and consumers to explain clunkers criteria, according to the study. Maritz said an opportunity existed to better educate Americans on how the program works. More than 80 percent of people who wanted to participate in cash for clunkers had a trade-in vehicle that did not qualify, according to the study. “We know most of the problem is in education around what vehicles qualify, in terms of their trade-in,” Fish said. Wilbur Ross, chairman of International Automotive Components Group, said during January's Automotive News World Congress in Detroit that the cash-for-clunkers program was feeble and poorly administered compared to a similar program in China. China budgeted $14.8 billion for its program, compared with $3 billion in the United States. Ross favored another cash-for-clunkers program, saying the government should do it as soon as possible. Cash for clunkers gave consumers up to $4,500 in rebates on a new vehicle if their trade-in and new purchase met certain requirements. The program ran from July 27 through Aug. 25, 2009, though dealerships started taking applications as early as July 1. Maritz's study was part of its New Vehicle Customer Study, a year-round survey of new-vehicle buyers and lessees. The study generates about 200,000 responses. In July and August of last year, Maritz assessed the purchasing motivations, demographics and psychographics of 35,983 new-car buyers.